My truth around starting your meditation practice, and things i sell to help you be consistent and comfortable. Meditation is my chosen pathway to come inward, and see my life as a blessing. It is something that isn't always easy, and it can be confusing some days, I can not feel like it if its too late, too early, I'm too hungry, too full, too tired.. you know... you got the same list running around in your mind. I know from experience setting up an amazing powerful meditation space draws you to it, even when you have excuses. It becomes a place that acts like a solstice from the crazies of life, where you are safe and connected to your true light. Meditation is meant to be enjoyable, it is challenging, strengthens your body, mind, and spirit. It is work that directly translates into every aspect of your life. This is a big reason why our medical system is now PRESCRIBING meditation classes instead of or along side medications. Meditation NOT Medication - wouldn't that be a great new reality? The absurd rise in attention deficit disorders, anxiety disorders, suicide, addictions to technology.. helped make my mind up about becoming A MODERN MEDITATION STORE. 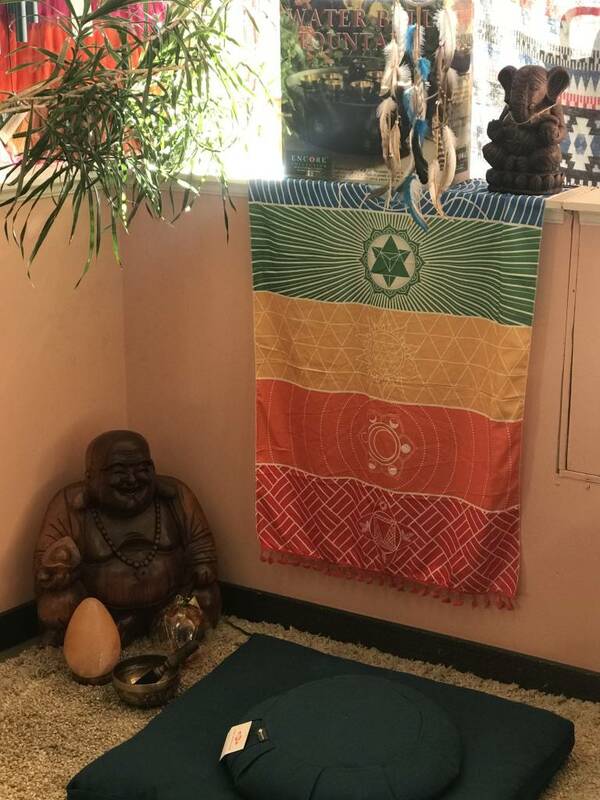 We need to have places like SoulStar Boutique up front and center talking about meditation, advocating the benefits, walking our talk (my current streak is at 28 consecutive days!!! hoot hoot) In 2016 I joined a great free app called Insight Timer it is something the monk used at the Denman island Hermitage when i was there on a silent meditation retreat, so i figure if its good enough for legit monks, then must be good for us common folk! I highly recommend it there for the healing and natural beauty. Things you may want to create a meditation place in your home. A journal, cushions, sound, incense, candles, beautiful crystals and tapestries. You can take pride in creating a place that has deep meaning for you, if the Buddha doesn't invoke that deep connected to spirit feeling inside of you then the Dali Lama himself would be the first to tell you Buddhism is his way, and to follow your way! If it is planting seeds in a garden, a vase of flowers and an acorn may have this profound effect on you. Your meditation space IS THE RIGHT PLACE to inquire about you and to peel away the masks of social expectations, it is a place to come to like an innocent child.. and to create a soulful experience. All the stages and steps kind of drive me crazy.. it is actually about breathing in the silence within. Stretching and savoring longer moments of stillness, and just simply scheduling a specific amount of time each day to be with yourself, no expectations, just allowing you to BE YOU for a change. Not to Do your duties to your family, your work, your community, not to shop or eat or Facebook post.. just to sit to listen to the divinity welling up within you. The Hermitage is amazing, you can get a private little cabin, and you get all your food and meditation looked after, you just sleep and walk and sit.. its quite a magical experience.